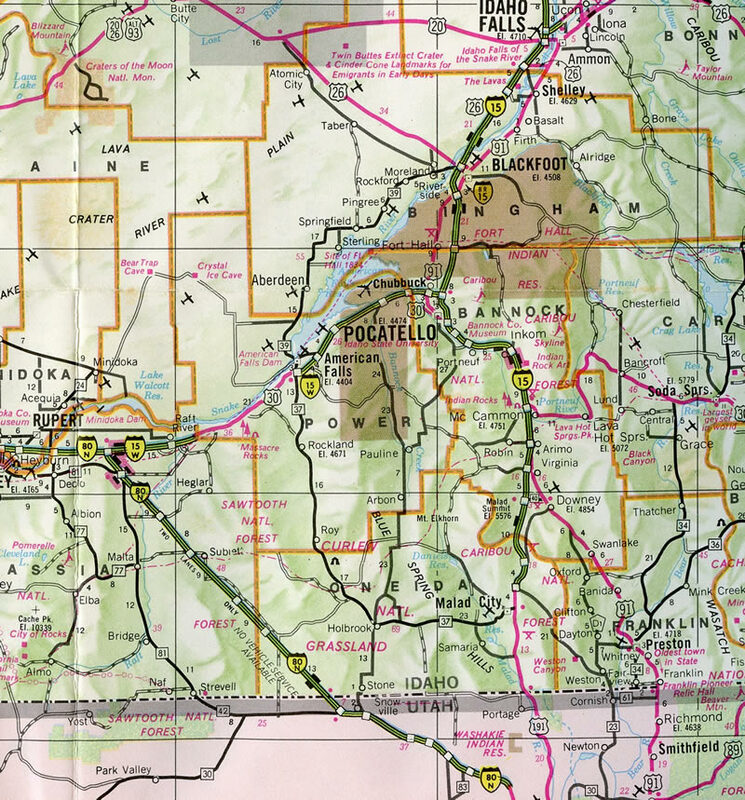 The Western Interstate 86 is a rural route linking Interstate 84 east of Twin Falls with Interstate 15 at Pocatello in southeastern Idaho. The freeway parallels the Snake River (Lake Walcott) northeast from Raft River to American Falls. East from there, the route flattens out somewhat adjacent to a Union Pacific Railroad line to the Pocatello vicinity. There is an eastern Interstate 86, stretching from Erie County, Pennsylvania across the Southern Tier of New York. That route was established in 1999. Prior to that, a second I-86 ran from Hartford, Connecticut to Sturbridge, Massachusetts from 1969 to 1984. Other split routes include Interstates 76, 84 and 88. Interstate 86 follows U.S. 30 (former U.S. 30N) throughout its route in Idaho and has one business loop in American Falls. An excerpt from the 1976 Idaho Official Highway Map showing the interchange array along Interstate 15W (now Interstate 86). 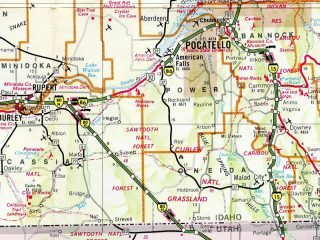 Southeast Idaho – 1973 Idaho Official Highway Map. 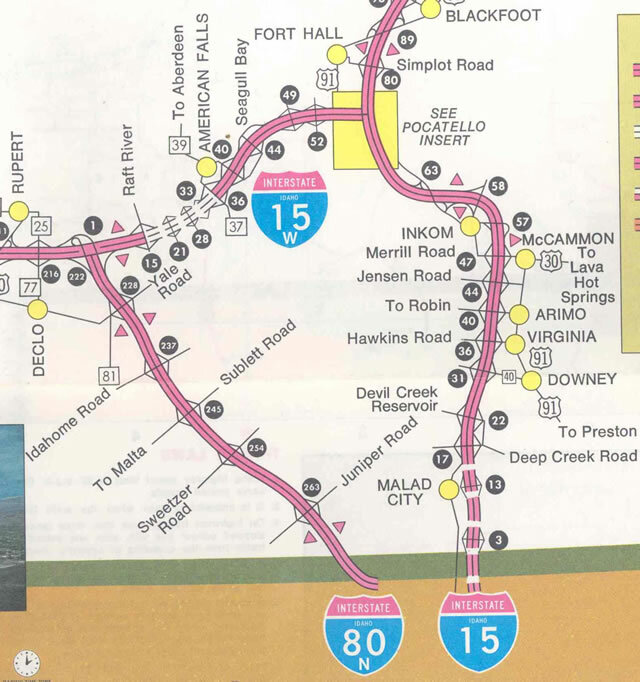 Interstate 15E was completed from I-80N east to the Power County line and west from Pocatello to Idaho 37 (Exit 36) outside American Falls. Completion of the freeway directly over laid the remainder of two-lane U.S. 30 along the Snake River. 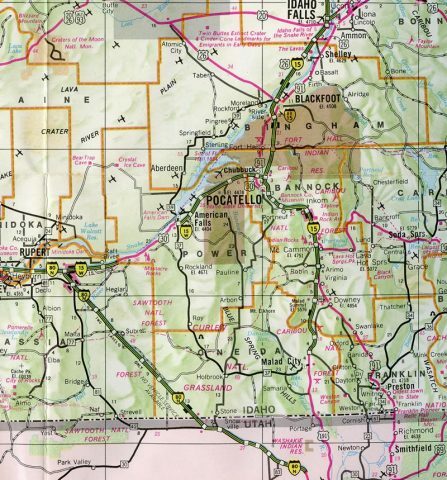 Southeastern Idaho – 1978 Idaho Official Highway Map. Interstate 15W was renumbered as Interstate 86 three years before sign changes were made along I-80N. Both renumberings were approved by AASHTO in 1977. Former button copy sign predating the 1980 change of Interstate 15W to 86 on I-84 & U.S. 30 east. Photo taken by Jeff Royston (07/11/07). The first sign for Interstate 15 along I-86 east precedes the diverging diamond interchange (DDI) with U.S. 91 (Yellowstone Highway). Photo taken by Jeff Royston (07/11/07). Exit 61 departs for U.S. 91 (Yellowstone Highway) to Chubbuck and Pocatello. Exits 63A/B follow for Interstate 15 north to Idaho Falls and Butte, Montana and south to Ogden and Salt Lake City, Utah. Photo taken by Jeff Royston (07/11/07). Advancing east toward the trumpet interchange (Exit 63) with Interstate 15. Photo taken by Chris Elbert (03/06). Exits 63A/B partition at the east end of Interstate 86. Photo taken by Chris Elbert (03/06). Former button copy sign posted two miles ahead of Interstate 86 west (Exit 72). Photo taken by Chris Elbert (03/06). A half mile north of Exit 72 with I-86 west to American Falls, Twin Falls and Boise. Photo taken by Chris Elbert (03/06). Southbound Interstate 15 reaches Exit 72, Interstate 86 west to American Falls and Twin Falls. The next exit is Exit 71, Business Loop I-15 south into downtown Pocatello. Photo taken by Chris Elbert (03/06). Exit 71 leaves I-15 north for Pocatello Creek Road, one mile ahead of the trumpet interchange (Exit 72) with Interstate 86 west. Photo taken by Kelly G. Kawamoto (08/00). The connection from Interstate 15 north to Interstate 86 west is a left exit. Photo taken by Chris Elbert (03/06). Northbound Interstate 15 reaches Exit 72, Interstate 86 west to American Falls and Interstate 84 west to Twin Falls, Boise, and Portland, Oregon. Photo taken by Chris Elbert (03/06). Vintage button copy sign on I-84 east for Interstate 86and the split with U.S. 30. Photo taken by Jeff Royston (07/11/07). The Interstate 84 mainline defaults onto I-86 & U.S. 30 east toward American Falls. I-84 makes a TOTSO (turn off to stay on) movement at the forthcoming exchange. Photo taken by Jeff Royston (07/11/07). Interstate 84 angles southeast to Tremonton, Utah, where it combines with I-15 to Ogden. I-84 parallels the Snake River east to Bannock. Photo taken by Jeff Royston (07/11/07). The first advance signage for Interstate 86 and U.S. 30 (Exit 222) appears two miles out along I-84 westbound. Photo taken by Steve Hanudel (05/17/06). Westbound Interstate 84 meets I-86 and U.S. 30 at Exit 222. I-86 & U.S. 30 east overlap to American Falls and the west side of Pocatello. U.S. 30 west joins I-84 to Heyburn. Photo taken by Steve Hanudel (05/17/06). "Interstate 80 to become 84." The Deseret News, August 13, 1977.